Height 5 feet 5 inches. Weight 150 lbs. Chest measurement 36-38 inches. Vaccination mark. 26 July 1917 - wounded in action in France; admitted to the Field Ambulance on 27 July 1917. 13 August 1917 - returned to duty. Thomas Lane was one of fourteen children of Andrew and Julia (née Ring) Lane, of Carriganes, Kingwilliamstown, County Cork, Ireland. Born on 1 September 1890 (1888?) at Carriganes, Thomas, a 13 year old scholar, was at home at Carriganes with his parents, siblings Denis, Ellen, Julia and five others in 1901. By 1911 these four were away. On 5 January 1911, Thomas, a farm labourer, and two sisters – Ellen and Julia – left London on the “Corinthic” bound for New Zealand. His brother Denis Andrew Lane, had already settled at Winchester Settlement. When he enlisted at Temuka in October 1916, having handed in his name at Temuka, for enlistment with the 22nd Reinforcements, Thomas was farming on his own account at Winchester near Temuka. His medical examination was carried out at Temuka by Dr F. A. Scannell, who himself served in World War One. It was reported in the Timaru Herald that T. Lane, farmer, Temuka, single, had enlisted in Timaru on 27 July 1916. He nominated two family members as next-of-kin, namely his father Andrew Lane, of Carriganes, County Cork, Ireland, and his brother Denis Lane, of Winchester Settlement, Temuka. Tom was one of ten local soldiers farewelled publicly at a packed Drill Hall at Temuka in mid October 1916, when a programme considered a musical treat was presented in their honour. The speaker, Lieut. Blathwayt who had been on Gallipoli, after complimenting the Patriotic Committee on providing bright spots for the soldiers to look back on in the trenches, said that those being farewelled "would become our guardians and protectors". He impressed upon the soldiers that discipline was the success of the Army and that cleanliness came next, as it meant health which was necessary to win victory, before he wished them health and a safe return. How many came back? Not Thomas. On send-off day, 18 October 1916, following afternoon tea and speeches, the men paraded through the main street to the station where the departing soldiers left to the cheers of the Temuka people. Thomas left Temuka, where he had spent his final leave, on his return to camp in January 1917. A social evening was held at Winchester, to bid him farewell. A very large gathering of friends from all parts of the district enjoyed song and dance, bagpipes, and dancing in a marquee until an early hour the following morning. Mr C. Newman, the host, spoke of the many good qualities of Private T. Lane as a neighbour, and wished him good luck and a safe return to Winchesterr. A month later he embarked with the Canterbury Infantry on the “Navua” for Devonport. After training at Sling he proceeded overseas and joined his Battalion at Rouen in May. It was 10 August 1917 when his brother received word that Tom had been wounded. He was wounded in action on 26 July and admitted to the Field Ambulance. After two and a half weeks he returned to duty. Two months later the word was that he had been killed in action. Thomas was killed in action one year and one day after enlisting, just eight months after embarking and less than four months after joining his battalion at Rouen, France. 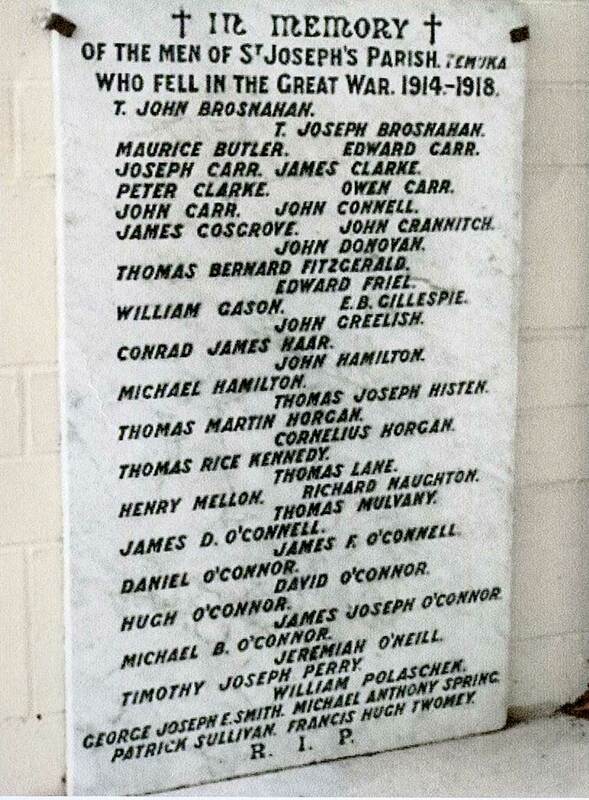 Casualty list 700 contained the names of 234 men killed in action. In the aftermath of an early morning advance, Thomas became a victim of the Passchendaele offensive, falling on New Zealand’s blackest day. Perhaps he was one of the determined individuals who tried to get through the German barrier, but were quickly killed. He was buried at Passchendaele, possibly where he fell and probably not a formal burial. Thomas had been in New Zealand for five years when he enlisted in 1916 at Temuka. Here was a young man who had emigrated from Ireland to a new life in New Zealand, and six years later while serving his new country he was a casualty of the Great War. He was described as a steady, well living young man, highly respected and liked by all who knew him. He was one of the many regularly remembered in the Temuka Leader Roll of Honour – “A sacrifice is made by every man who enlists and goes to the front.” Tom was a member of the Foresters' Lodge. On 13 July 1920, the Lodge members unveiled in their hall a decorative Roll of Honour, which names 107 brethren who went to the front and underlines in red the names of sixteen who lost their lives. The name "T. Lane" is among those who made the supreme sacrifice. His medals (British War Medal and Victory Medal), plaque and scroll were to be sent to his father at Kingwilliamstown, Carriganes, in Ireland. On 12 October 1918 in the Timaru Herald, an In Memoriam notice was inserted by his sisters and brother. Tom did leave a will, dated 9th October 1916. He appointed his sisters, Ellen of Pleasant Point and Julia of Timaru (December 1919 both in Wellington), to be executors and trustees of his will, and he made provision for his parents. Probate in his estate was granted in Christchurch in early December 1919. At the probate hearing both Ellen and Julia said that they had seen Thomas in the uniform of the New Zealand Expeditionary Forces, and that they had written to him and had received letters from him written on active service (none after 12 October 1917). They believed the estate and effects of their brother Thomas to be under the value of £300. The lapse of one year in applying for probate was because Ellen had been absent from New Zealand from July 1918 until 1 November 1919. A death certificate is annexed to the Court documents. His brother Denis Andrew Lane was drawn in the ballot for South Canterbury’s quota of the 31st Reinforcements in 1917. In March 1919 Mr D. A. Lane acquired two lots of land fronting the Boiling Down Road. In December the same year he held a clearing sale – sheep, horses, cattle, implements, and a lot of sundries, and moved to Hilton. In time Ellen, Julia and Denis all moved to Wellington. Thomas was possibly a cousin or other relative of Denis Francis, Edward Timothy, Eugene and Humphrey William Lane. One of the hundreds whose bodies were not recovered, Private Thomas Lane, 38966, is honoured on the Tyne Cot Memorial, Tyne Cot Cemetery, Zonnebeke, West-Vlaanderen, Belgium, one of 35,000 soldiers – 1176 New Zealanders - commemorated on this memorial. His name is recorded on the Timaru Memorial Wall, the Temuka War Memorial, the Temuka St Joseph's Church Memorial, and the Foresters’ Lodge Roll of Honour. The Temuka St Joseph’s Church Memorial, an “exceedingly beautiful” monument to the memory of those who had fallen in the war, was unveiled after a Memorial Service on 25 April 1922. During the service appropriate music was provided by the choir and an excellent address was delivered by the Rev. Dr. Kennedy. The name of Thomas Lane was heard again on Anzac Day, 1927. A Requiem Mass was celebrated at St Joseph’s Church, Temuka. The celebrant preached a very stirring sermon based on the Book of Wisdom (Chapter III, Verses 2-5). He pointed out that the Gallipoli campaign and later “gigantic episodes” would remain for all time a wonderful symbol of the age-old courage of men. He reminded the lads present that the enormous sacrifices made by the soldiers of New Zealand and other parts of the Empire were helping them to have brighter and better lives, and that all should render thanks to God, who had delivered them out of the hands of the enemy. The Temuka Borough memorial was unveiled in August 1922 before a very large gathering in the domain, including Temuka Territorials and Cadets, Temuka and Geraldine returned soldiers, the Temuka Pipe Band, the Salvation Army Band, the children of the district schools, national and local dignitaries, and local folk. Opening proceedings, the Mayor said “We regret that this occasion has arisen, but having done so we must look back with pride at the actions of those who rose to the call of the Motherland, which was in peril. Many of those brave boys who left these shores did not return, and we have erected this memorial to their memory, . . . “ Following hymns and scripture readings, His Excellency the Governor-General formally unveiled the monument and the local M.P. read out the names inscribed thereon.